The silk tree is a welcome edition to the ecological garden as it is both highly ornamental and multi functional. It produces beautiful pink rose blooms which remain for much of the summer and are then replaced by striking seed pods that hang on the tree for much of the winter. It is easily grown in well-drained but moist soils in the full sun to light shade, although the best flowering result occurs in full sun. 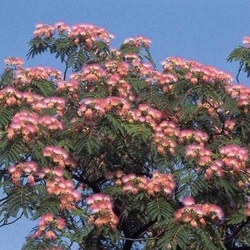 The silk tree is a nitrogen fixer and tolerates a high pH, saline soils, high winds and drought. It is quite tolerant of being transplanted and pruned and can be trained to climb. A perfect choice for a woodland garden on a sunny edge, or a courtyard garden. To order this plant please contact us balkanecologyproject@gmail.com. native region: W. Asia and E. Asia - Iran to China. soil pH: acid-neutral -basic alkaline and can grow in very alkaline and saline soils. It is in flower in July - August, and the seeds ripen from Sept to November. Suitable for: light (sandy), medium (loamy) and heavy (clay) soils, prefers well-drained soil and can grow in nutritionally poor soil. Suitable pH: acid, neutral and basic (alkaline) soils and can grow in saline soils.